Since returning from winter break, students, faculty, and Whitman staff settle into their new 2019 spring schedules. Among those adjusting are Whitman student theater-makers who are diligently producing, designing, directing, or acting in the annual student-written One Acts. This Harper Joy tradition begins each fall, when a script selection committee requests submissions and deciphers student-written scripts, finally selecting three winners to be produced at the start of the spring semester. The three scripts selected this year are I Got You, Babe by Matthew Schetina (class of 2019), Worth A Shot by Mathilda Chapin (class of 2021), and Moth by Rachael Zucker (class of 2022), and are to be directed by Rose Heising (class of 2020), Ella Meyers (class of 2021), and Mathilda Chapin (class of 2021). In their answers below, student playwrights and directors reflect on the process of creating theater, and being given a platform to have it be seen. 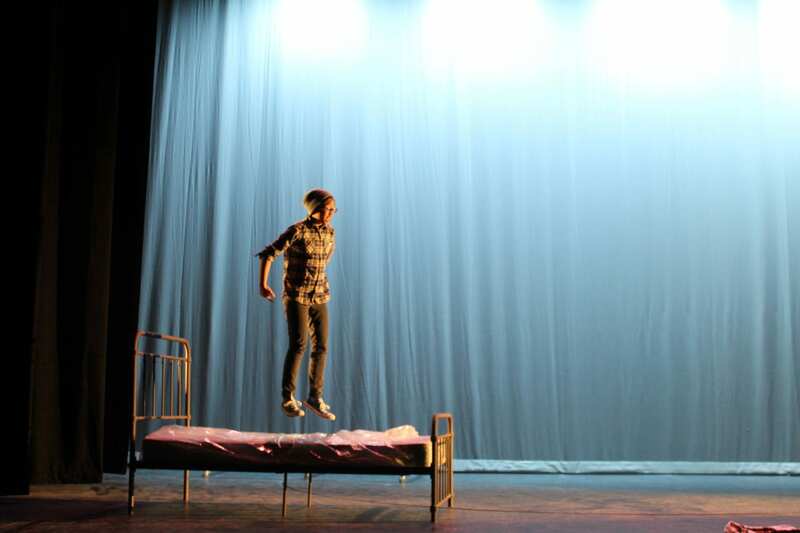 The One Act play festival is such a neat opportunity for student writers to have their work produced. What is it like seeing the world you created on the page come to life? MATT SCHETINA: It is pretty magical to see your friends imagine and breathe life into your work. Everything that the cast and production team have come up with fits delightfully with what I first visualized, yet they’ve shown me sides and interpretations that I never would have even considered. It is really an honor for my play to have a team of creative minds set about making it real. RACHAEL ZUCKER: Seeing people audition for my play was a really exciting and proud moment for me. Just knowing that I wrote those words and that people want to say them. It’s validating and satisfying to hear my words come alive in the right mouth. Going to production meetings is fun as well because the designers have all analyzed my script in ways I never thought of. MATHILDA CHAPIN: Seeing my work brought to life on stage is one of the most amazing experiences that I have had in college. It is interesting to see how Ella Meyers interprets the text in ways that are similar or different to my original intent, in many ways enhancing the final product. How do you prioritize writing in your life? MATT: Writing is an outlet, a haven, a way to process and reconsider, a way to see a clearer past or a different future. It is an important part of my life, and this process has shown me how one little idea can take on a life of its own, outside of me and my mind. MATHILDA: On most days I spend more hours writing than I do sleeping. I aspire to be an author, probably writing science fiction, most definitely of the comical variety. I think that most people would agree that the “real world” is a little bit terrifying at the moment to say it mildly. As important as it is to confront and act upon that insecurity about the future, I have found that the most useful thing that I can do to keep myself sane on most days is to occasionally disappear into a world of my own, where I set the rules. A world full of humor, interesting characters, and situations that, unlike in the so called “real world,” I can control. Some stories are funny, others sad, but all possess some form of meaning or purpose. In a world where finding either of those things can take a lifetime, there [is] nothing more cathartic than writing your own. What role does the playwright have when you are able to collaborate with the director on your work? RACHAEL: The play [Moth] means a lot to me personally, not just because I wrote it but because of the material, and I have a very clear image in my mind of how it’s “supposed” to be. It’s hard letting go of that image and completely handing it over to a different person. No one’s vision is better, they’re just different, and I’ve had to take a step back and let go of a lot. What aspect of this process excites you the most? MATT: I am so excited to see the finished product, as I’ve gone to a few rehearsals for input but largely left the production team to make it their own. I hope everyone can see some of themselves in this play, for better or worse, in pride or regret. It presents what I hope are human characters; real, fallible, loving. So, I see that not only [is] one of your scripts being produced and directed by another student director, but you [are] additionally a director of someone else’s piece this year. How does the creative process differ for you from writing a world and directing one? MATHILDA: Being a playwright and a director for the Whitman One Acts are very different experiences. When you write a piece of theater, you are creating something original, a piece of art that reflects your ability as a writer and also who you are as a person. At least for me, my writing is the most accurate self portrait that I could produce… As a director, being handed somebody else’s child, I am intimately aware of the trust that is placed in me to interpret the work and to do my very best to honor the authorial intent, play to the actors strengths, and also follow my vision and understanding of the work. Briefly summed up, the biggest adjustment to make between solitary writing and the collaborative process of directing is the ability to draw from the creative potential of so many more brilliant artists, transforming a simple reflection of the author into a work with a full life of its own. In many cases when directing a play, the director may not have easy access to the playwright because of proximity or because the playwright is no longer alive. Here, the playwrights are peers who you might run into while walking to class. What has the process been like directing a show with the playwrights so available? ELLA: Working with a student playwright has been an exciting experience, especially since Mathilda is one of my good friends, and I’ve read some of her writing before and always loved it. Having her sit in on a couple rehearsals and share her intentions with the story and her own personal connections to it has been helpful to me as the director, as well as to my actors. ROSE: Working closely with the playwright has been a wonderful experience, because when I’m in doubt about something in the script, feedback is only a quick text or email away. Matt and I also met with Dramaturg Kristin Leahey, who sparked all sorts of interesting questions about gender dynamics in the scripts and prompted Matt to rewrite and flesh out parts of the script. The One Act festival offers such a unique opportunity for workshopping a piece of theater and presenting it in-progress (as most theater is) to a very supportive and thoughtful audience. What aspect of the play excites you? ELLA: This play [Worth A Shot] really grapples with a lot of interesting questions, and there’s definitely a philosophical element to it. It plays with death, religion, meaning, truth vs. illusion, and belief. But it leaves much up to interpretation, and I think that really allows the audience to engage with it on a deeper level. Also, the characters are really funny and quippy; they’re almost caricatures while also being surprisingly relatable. ROSE: This play [I Got You, Babe] in particular is fun to work on because the script offers a lot of freedom to the director. It includes several dance montages that were a delight to play around with, and moments between the lines that I’m able to flesh out more through blocking and other choices. What is the role of a director, according to you? ROSE: Not to puff up my own importance, but the role of the director is, in some ways, being everyone at once. You must think big-picture about the arc and momentum of the show, lighting, set, costumes, timing and transitions. It’s a balancing act between coming prepared with a plan to every rehearsal and being open to the whims of the moment. It’s not about forcing your initial vision, but rather shaping and reshaping through collaboration and play. ELLA: As a director, I hope that I bring the text to life. Mathilda wrote something that’s very fun to read, but the challenge here is making it just as fun to watch. There’s also the element of incorporating what the actors, designers, and everyone bring to the table to make one cohesive piece. 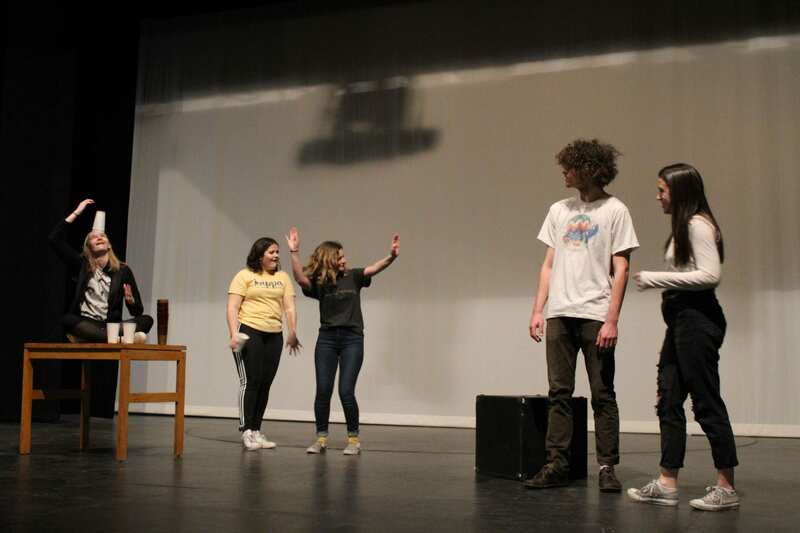 The 2019 One Acts will be playing on Alexander Stage February 7-9 at 8PM, and the 10th at 2PM. Get your tickets Here. Come! Watch! Vote! © Copyright2019HJT BlogProudly powered by WordPress | Theme: Gridster by ThemeFurnace.